Holiday cabins just 2 minutes walk from the beach. Experience a fabulous vacation at Birubi Beach Holiday Park and enjoy exquisite service, generous hospitality and cosy accommodation. The 27 deluxe cabins are built with comfort in mind and are furnished with particular care and equipped with modern amenities promising an elegant and comfortable stay, which is ever memorable. Outside you will find a great view from the verandah (with external locker), and some overlook the Tasman Sea with an outdoor setting for 6 and 2 car spaces, you can bring a boat or trailer and park it safely at your door. 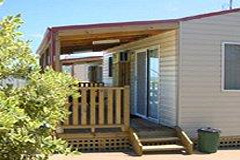 Birubi Beach Holiday Park is ideally located in the James Paterson Street and is at the gateway to the Dunes in Anna Bay. The Anna Bay village is just 5 minute walk from the property and is in proximity to many fine restaurants, wide range of retail outlets, cafe, shopping centres, markets and entertainment attractions. The tour desk would be happy to offer you as much help and information as possible in order to assure a totally relaxing holiday, free from worries. At leisure, you can have a bracing dip in the swimming pool and wash away all your fatigue. The amazing golf course allows you to indulge in a smooth game of golf. Each Cottage has a shady verandah and some have ocean views.